Report: When It Comes To Liquor Sales In Australia, Woolies Is the Booze King! A new report into the alcohol buying habits of Australians has found we spend $14.5 billion a year in take-away sales with Woolies and Coles the prime beneficiaries. The study by Roy Morgan Research found almost three-quarters went to supermarket-affiliated retailers, with hotel bottle shops and independent stores trailing well behind. The Woolworths’-owned Dan Murphy’s accounted for nearly 30 per cent of the total dollars— or $4.3 billion—spent by Australians on alcohol in 2016 (up from 25.4 per cent in 2015). Woolworths’ two other alcohol retailers, Woolworths Liquor and BWS, saw their market share shrink, but Dan Murphy’s growth was robust enough to ensure that, between them, the three Woolworths’-owned retailers have a total dollar market share of just under 50 per cent (49.2 per cent/$7.1 billion). A longer-term view reveals that Woolworths Liquor has been on the slide since at least 2012, while BWS’s recent decline comes after a period of relative stability. Dan Murphy’s has been up and down during this time, but has been increasing steadily since mid-2014. First Choice did the best of the Coles-owned liquor retailers, growing its market share from 4.5 per cent to 5 per cent ($0.7 billion) over the last year, but will need to remain vigilant against the threat of ALDI Liquor, which increased its share to 3.5 per cent (or $0.5 billion) from 2.4 per cent year-on-year, and has shown a steeper upwards trajectory over the last four years than First Choice. Year-on-year declines for Liquorland and Vintage Cellars mean that the Coles Group’s total market share has slipped slightly from 15.9 per cent to 15.5 per cent ($2.2 billion), and is well down on their 17.4% per cent share back in 2012. Overall, supermarket chains such as Dan Murphy’s, First Choice, Liquorland, BWS and ALDI Liquor amassed $10.5 billion of the total amount spent by Aussies on alcohol in a retail environment in 2016. Hotel bottle shops (such as Thirsty Camel) accounted for $1.8 billion, ahead of independents such as Cellarbrations ($1.5 billion), wine clubs ($0.7 billion) and duty free stores ($0.1 billion). 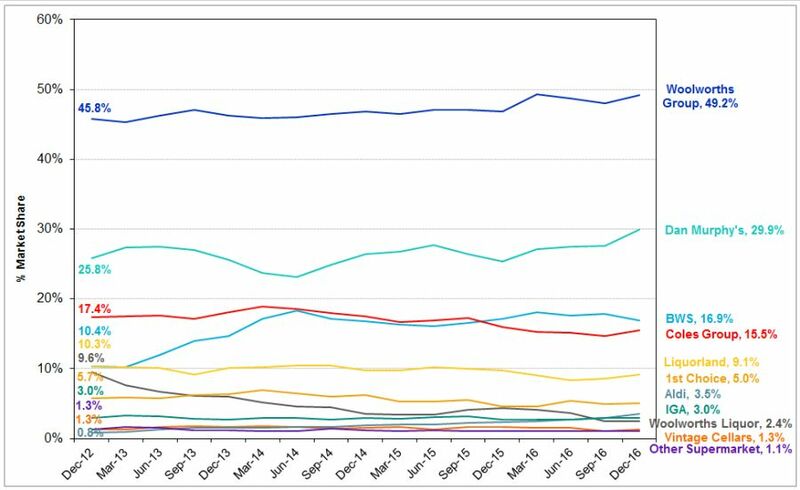 Proportionally speaking, supermarket-owned chains now account for 72.3 per cent of the total market share (up on 69.1 per cent in 2015), with other alcohol retailers trending either downwards or steady. 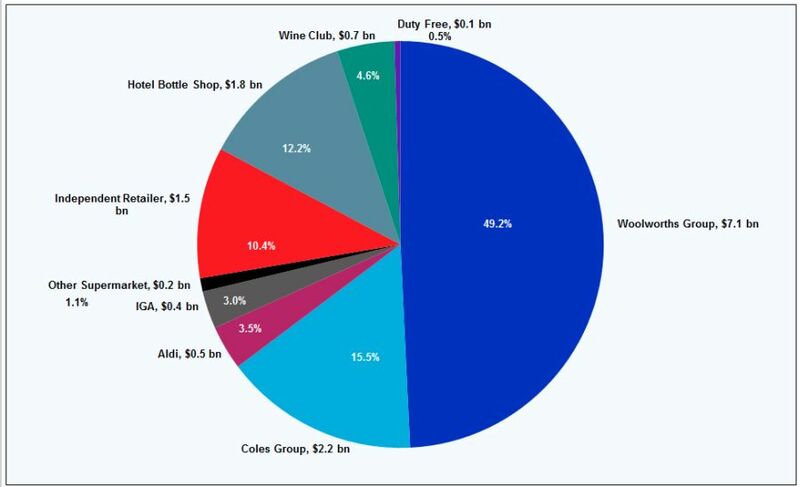 The independents’ share declined markedly (from 12.7 per cent to 10.4 per cent), while duty free stores also suffered (now accounting for just 0.5% of total alcohol retail dollars spent, down from 1.4 per cent). Hotel bottle shops and wine clubs were relatively stable.